After swaying the fans with his last song that has received immense love and much appreciation from the audience, 28 year-old singer is back with a new peppy number, ‘Bhabhi the Wedding Song’. The song in collaboration with Crazy King has already crossed half million views on YouTube and grabbing wide attention among music lovers. The song has a touch of Punjabi as well as apart from Hindi. 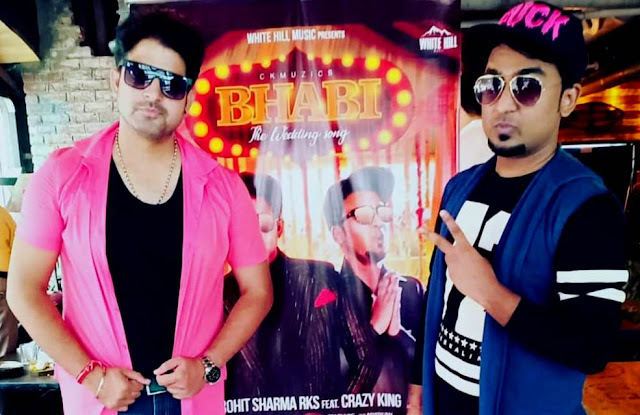 Yaar Tera VIP fame singer, who was in the city yesterday to celebrate the grand success of his latest release, Crazy king said, "I am working in this industry from last 4 years and I have collaborated with many singers. I recently did a song to unite India-Pak called as 'Rab Maula' which has ruled the charts. I am happy that young generation are liking my new taste of music. Hence we the artist always get good work and so I and my co-lyricist Shardool have decided to have an song in which everyone dances and have an song that's never before been played in marriages and so we decided to do the song for all the bhabhis out there .Then I had done the composition part and written the lyrics in the manner to enjoy an marriage." “I started singing at the age of five. From singing at Jagrans to reaching this stage, it’s been a phenomenal journey,” said Rohit Sharma RKS who was a part of the show Indian Idol Season 3 where he amazed everyone with his power packed performances. A White Hill music release Bhabhi has been penned by Shardool and Crazy King himself while the music is rendered by Crazy King. The video has been produced by Vishnu Sharma. And special thanks to Suresh Jajoo , Vikrant Sharma and Rajveer Kishan. and encouraging youngsters in the music industry. The singer and rapper who is currently rejoicing the success of his latest single has more songs in the pipeline.